Well, it was a busy weekend, packed full with decorating, shopping, and traveling, not necessarily in that order! But it was fun. Amanda and I took a van load of stuff down to the barn in Frederick, for the upcoming sale on the 15th, 16th, and 17th. I couldn’t possibly give you all the fun details of my weekend, but I will share two of them. 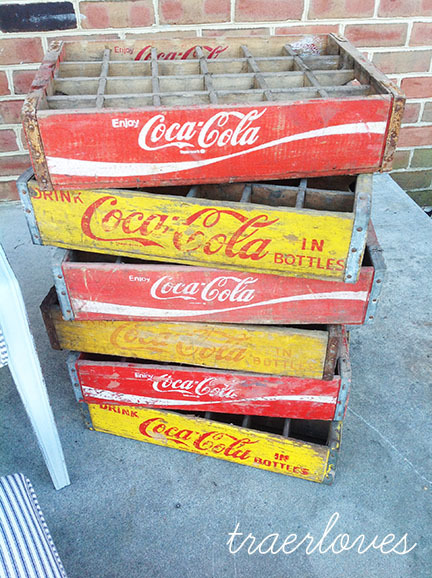 On Saturday I checked out a Craig’s list add for Coke crates. It was slightly disappointing in the fact that they had listed there were 60 crates, but when we arrived there were only about 30, and maybe 20 of them in good shape. But here are a few that survived and I think they look awesome stacked like this. I also wanted to feature my friend Amanda who is an amazing upholsterer. This chair has been in the works for sometime now, and it turned out wonderfully! 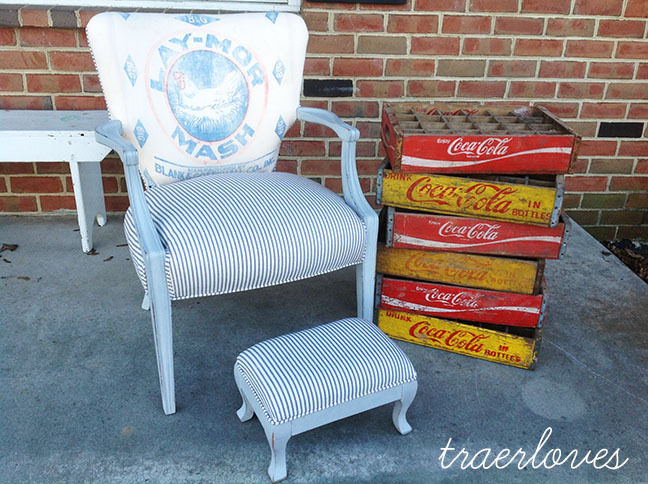 I believe the frame of this chair was a roadside find! The best place to shop, I might add! Amanda let me paint the frame Paris Grey. I gave her the Chicken Sack, that was a gift from a friend of mine, because I knew it would look amazing upholstered on a chair. I also begged her to use the blue ticking as well! Just can’t get enough of that stuff! So I guess if you are paying attention you noticed I am kinda in love with this chair. But alas, I have way too many chairs, and a little house, so she is up for sale this weekend at the barn sale! Side note….I think I have heard that you can use a half of can of Coke in the chicken, then bake it in the oven, and it tastes amazing. Anyone every done that? Well I hope everyone has a wonderful week! P.S. Amanda and I bought 18 yards of vintage german linen this weekend, stay tuned to hear our plans for that! ok so i totally wondered if you were going to bring up the coke/chicken recupe. i have never had it, but i need to try it!!! and of course i love that chair! Connie Clay has a recipe in the mops cookbook from a couple years ago with coke and chicken.